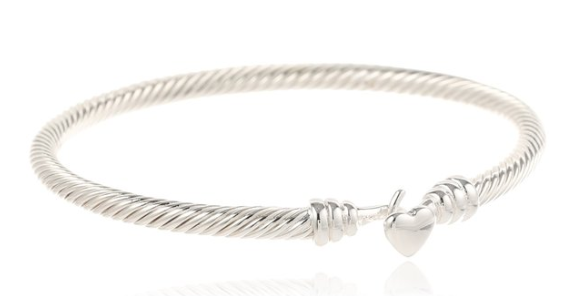 Gorgeous Sterling Silver Plated Heart Cable Bangle Bracelet Just $20.24 + FREE Prime Shipping (Reg. $50)! You are here: Home / Great Deals / Amazon Deals / Gorgeous Sterling Silver Plated Heart Cable Bangle Bracelet Just $20.24 + FREE Prime Shipping (Reg. $50)! What a lovely Valentine’s Day Gift this would make!! Hurry and grab this Gorgeous Sterling Silver Plated Heart Cable Bangle Bracelet for just $20.24 (reg. $50)! This reminds me of a Tiffany & Co. or James Avery bracelet! I love it!